Imagine what it would be like to take out all the negative thoughts and beliefs in your mind that are holding you back, and replace them with uplifting positive ones that bring joy, happiness, and success into your life? Starting today, you can do just that! It’s hard to keep a positive outlook in everyday life. There are plenty of frustrations and let downs that prevent us from seeing that good does exist. How can we think positive thoughts when we’re facing illness, money problems, family issues, or trauma? Furthermore, thinking Positive is one of the most important of the habits we can create, because you know that everything starts in the mind. Thoughts turn into words, which then turn into actions, which create your destiny. If you tell yourself you can’t do something, you will ultimately find failure. If you tell yourself you "CAN" do it, you have increased your chances of accomplishing that goal. Sounds easier said than done, right? 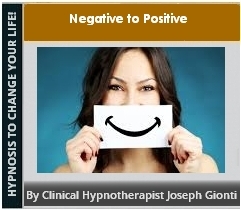 Well, the great news is that hypnosis can help you rid yourself of negative thoughts and replace them with positive ones. It can also help keep your mind clear and focused on creating this positive mental attitude. Create this as habit and it will bring great success to you in your personal and professional life - beginning today!